This photo shoot that I recently had with The Waldorf Astoria while in NYC has to be the closest I’ve ever felt to feeling like a princess. Their Royal Suite left nothing to be desired. It was outfitted with everything from a formal dinning room, to a glamorous bathroom vanity and a master bedroom fit for a queen. 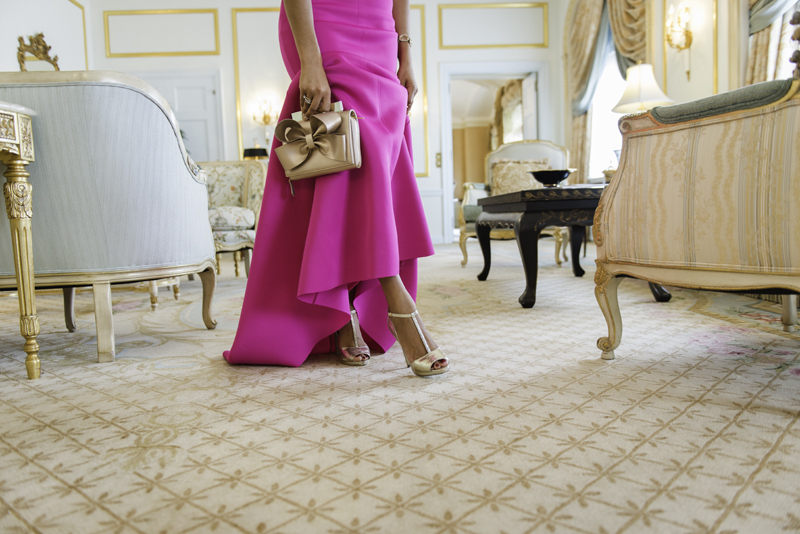 My hot pink gown was the perfect look to showcase because the color complemented the decor in every room. I styled it with gold t-strap pumps and a glamorous bow clutch. It was fun pretending to be a princess for a day and getting to play dress up. This suite is breathtaking! And so is that dress- wowza. Wow! Such stunning photos. And that room! It's incredible. That dress is drop dead gorgeous! You make it look even better. Beautiful and graceful. Amazing shoot.